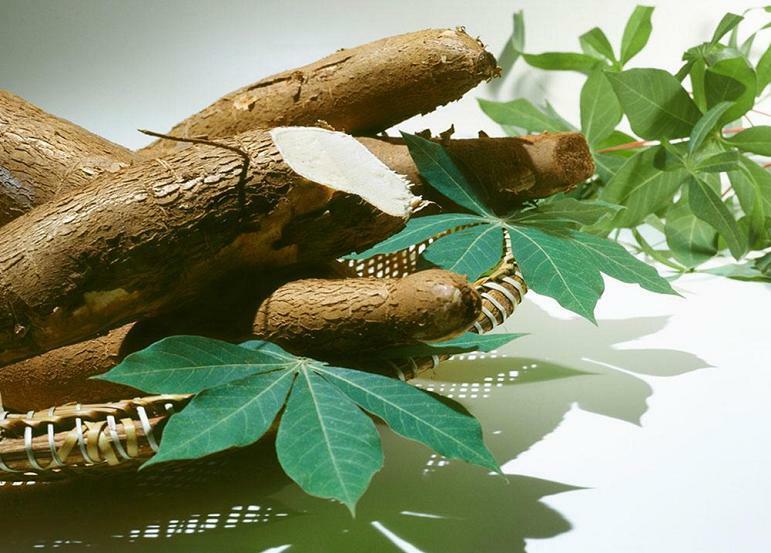 The drug is the starch or leaf of Manihot esculenta Crantz (Family Euphorbiaceae), cultivated in thick soils on hillsides, hilllands or sandy lands, cultivated in Fujian, Taiwan, Guangdong, Guangxi, Hainan and Yunnan of China. The herb and tuber contain hydrocyania acid, saponins, volatile oil. Bitter, cold, slightly toxic; heart meridian entered. The starch is used as anti-inflammatory antitoxic and antipyretic, to expel heat from blood, for the treatment of hydrops. Leaf is used as antioncotic and antitoxic, externally used for carbuncles and sores. Proper dosage is for external application, pounded for applying with the fresh.